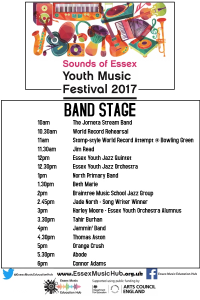 Essex Music Services presents a free two-day Youth Music Festival to celebrate music from across Essex, on Saturday 1st & Sunday 2nd July. 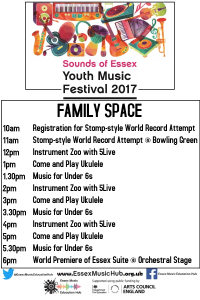 No ticket required, but registration is essential: Click here to sign up. 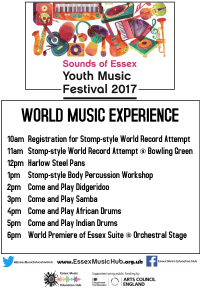 Celebrating 60 years of Youth Orchestras and music from schools and colleges across Essex, Saturday starts at 10am with a Stomp-style performance world record. Click here to see the video, and start learning the routine! 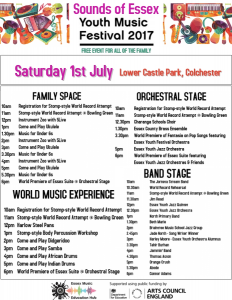 As part of Colchester’s #BigSunday, performers from across Essex come together for two performances of a newly-written Grime Opera. 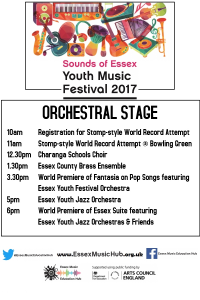 Featuring MC Eyez, Max Wheeler, young rappers and electronic artists, back by Essex Youth Orchestra and Essex Youth Gospel Choir.